InLoox PM 8 organizes your file or SharePoint Server. Every project offers access to related documents. With a click of a button you can quickly link the saved documents in you folder to the project by adding or changing a document folder path. This feature is also very useful, if you want to link a lot of new documents. All you need is just update your document page. On the Settings tab, in the Document Path group, click Folder . The added document path is now displayed in the Document Path box. Click , in the Document Path group, to delete the document folder path. 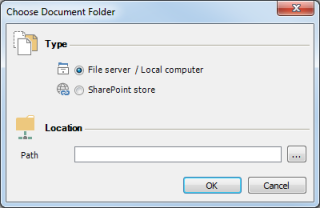 In the Type area choose between File server / Local computer and SharePoint store. In the Location area click . Choose the folder you want to be read in. On the Settings tab, in the Document folder group, click Update Document List. The folder content will be read in the document section of the project. You can start to work with it right away. In the Documents area, on the left side the folder view will be displayed automatically. For more information see Create a subfolder. Under Documents click Document store. On the right side you will see the Document store area. 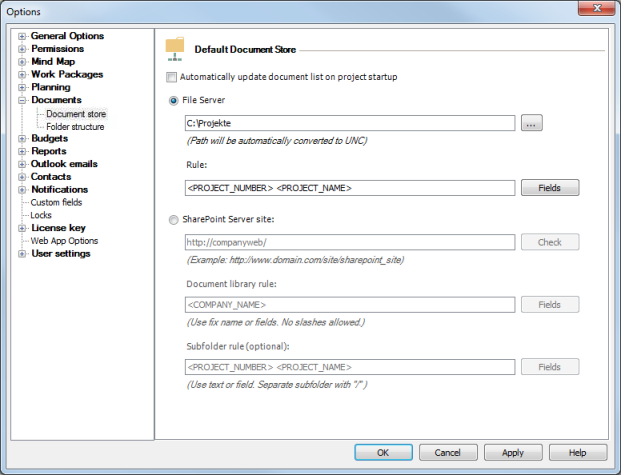 Select the Automatically update document list on project startup control box. Documents are read anew when the project is loaded. This option slows down the opening of a project but ensures automatically that the Documents page always shows current information. How to save and edit the document folder path | InLoox PM 8 • Copyright 1999-2019 © InLoox GmbH. Tous droits réservés.